Why Seagate and Sage Therapeutics broke away from indexes by posting major gains on Tuesday. 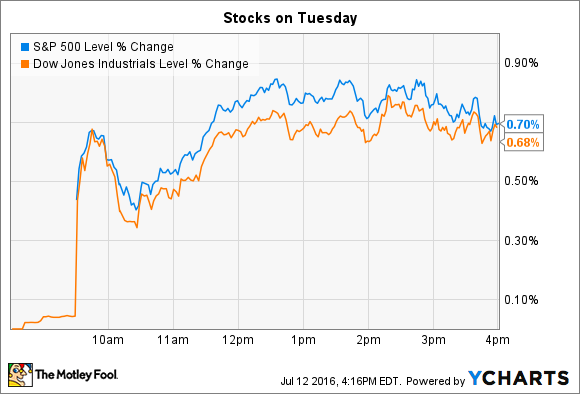 Stocks pushed further into record territory on Tuesday by posting solid gains. The Dow Jones Industrial Average (DJINDICES:^DJI) rose by 121 points, or 0.7% to reach a new high one day after the broader S&P 500 (SNPINDEX:^GSPC) posted its own all-time record. The S&P tacked on an additional 0.7% increase on Tuesday, leaving both indexes up 5.3% so far this year. Meanwhile, a few stocks managed to stand out by logging huge daily moves. Seagate (NASDAQ:STX) and Sage Therapeutics (NASDAQ:SAGE) were among Tuesday's biggest winners, rising by double digits following surprisingly strong business news. Data storage specialist Seagate was the S&P 500's biggest gainer with a 22% pop on Tuesday. The rally pushed shares to a 54% return since their recent low in May, yet they remain down sharply over the last 12 months. Tuesday's jump came after Seagate pre-announced fiscal Q4 results that showed improving operating trends. Sales clocked in at $2.65 billion and gross margin was 25%, which trounced management's bleak forecast, issued back in April, of $2.3 billion of revenue and a 23% gross margin. The difference was that Seagate saw strong demand for its high storage data drives that it calls HDD. These devices are proving popular as consumers and businesses move their data storage needs to the cloud. "HDD devices are where most data bits ultimate reside and our record HDD shipments in the June quarter, particularly due to enterprise demand, continue to support this thesis," CEO Steve Luczo said in a press release. Seagate's stock caught a slew of upgrades on the Q4 news, which added fuel to the share price jump. Wall Street pros liked the improving profit trajectory and are pleased with the cost-cutting plans that the company announced along with its quarterly results. Both trends make it less likely that Seagate's unusually large dividend payment will be sliced in the coming quarters. There may be a pharmaceutical answer to postpartum depression, or PPD. Sage Therapeutics' stock soared by 38% due to promising clinical trial news for its treatment of that central nervous system disorder. In a phase 2 trial its drug demonstrated significant improvement in the mental health of patients who had recently given birth and had been suffering from PPD. The results were broadly positive after just 60 hours of treatment, showing "the potential of the drug to provide relief from the debilitating symptoms of PPD," trial investigator Dr. Samantha Meltzer-Brody said, "and to markedly decrease suffering in women who are severely affected ." The test was conducted on a relatively small patient base of just 21 women. And the fact that the drug is just in phase 2 testing illustrates that it has a long way to go before it could make it to the market. Still, the test confirms prior positive research on this treatment and also points to more applications. "This demonstrates the potential broad utility of our [treatment] pipeline, not only for neurological disorders, but now for mood and affective disorders as well," CEO Jeff Jonas, M.D. said in a press release.